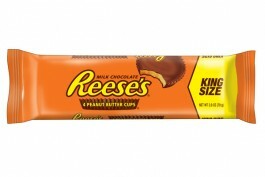 Are you a real Reese's Peanut Butter Cup fan? Then you'll definitely love this pack! Instead of 2, you'll get 4 Peanut Butter Cups. Milk Chocolate (Sugar, Cocoa Butter, Nonfat Milk, Milk Fat, Lactose, Soy Lecithin, PGPR, Emulsifier), Peanuts, Sugar, Dextrose, Salt, TBHQ (Preservative).